I am a big fan of stir-through pasta sauces and regularly use store-bought ones for ease of use and lowering stress when it comes to meal times and hospitality. There are some really great tasting ones out there and I heartily encourage their use if it means making hospitality easier. Having said that, the recipe that follows for home-made basil pesto is just so easy and yummy that I had to share it with you. The bright green and powerfully flavoured pesto that results is worlds apart from its perfectly-fine supermarket counterparts. This Stephanie Alexander recipe is one that I’ve cherished for many years because of its taste, ease, affordability and versatility: make it ahead of time and store in fridge for a later use, such as a main pasta dish or on sandwiches or even as a dip with crackers and cheese. 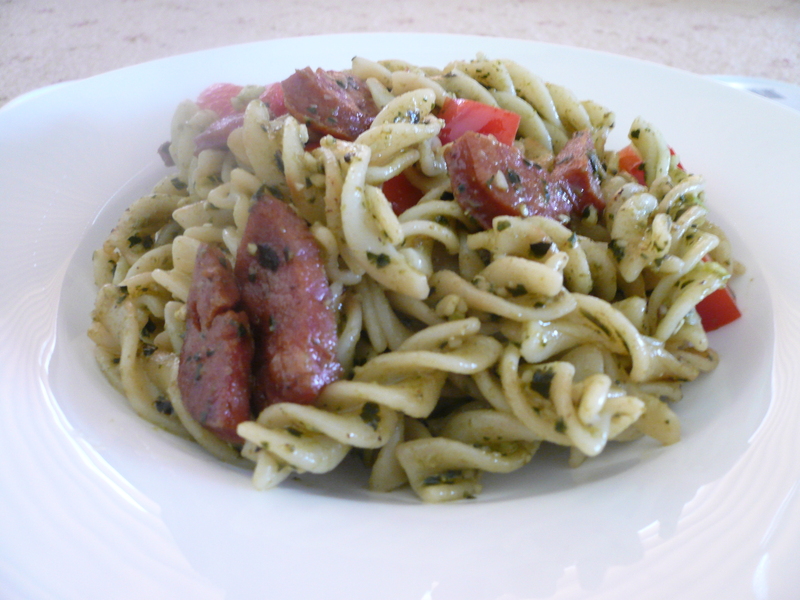 My favourite way to use it tossed through hot spirals of pasta with pan-fried chorizo cut into half-moon shapes with chunks of fresh capsicum. The quantities that follow make 250g of pesto and the photo above is a double quantity in a 500g jar. Depending on where you source your basil from, this little jar of basil bliss will set you back around $4. Put basil leaves, olive oil, pine nuts, garlic and salt in a blender or food processor and blend/process until smooth. Stop the machine once or twice and scrape down the sides with a spatula. Remove cutting blade and change blade to a fine grate. Put parmesan through the processor into the bowl on top of the basil mixture. Remove blade and mix well (or grate cheese with a grater and add to basil mixture and mix well). 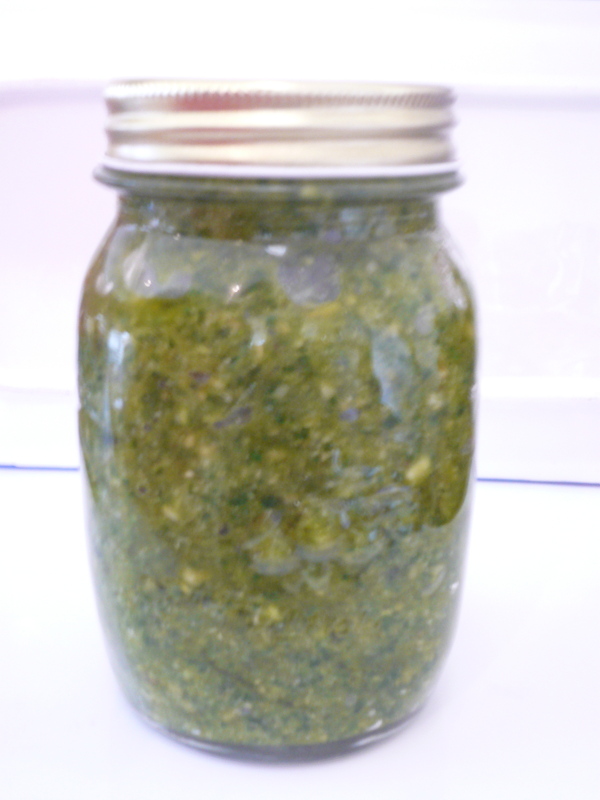 Spoon pesto into a clean and dry 250 ml-capacity screw-top jar. Press down with the back of a spoon to ensure there are no air pockets and seal with a film of olive oil. Store in the refrigerator. Oh yum! Will have to try that one!